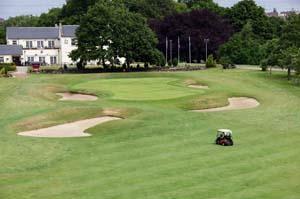 Normanton Golf Club01924 200900work Golf - 18 holeGolf in Yorkshire rarely gets better. Set within 145 acres of glorious Yorkshire countryside, with streams and lakes to add a little spice, each hole presents its own challenge to both high and low handicappers. A practice ground, clubhouse, and a superb golf shop make us perfect place to enjoy golf in Yorkshire. Designed by Patrick Dawson, the architect of some of the holes on the famous Augusta National course in America, it offers a true test of golfing ability and with the ninth hole returning to the clubhouse it makes NGC appealing to societies and visiting parties wanting to play 27 holes. The Hatfeild Hall of today has been tastefully restored, incorporating many of the original designs. Golf in Yorkshire rarely gets better. This magnificent one million pound clubhouse, with conferencing facility and ability to comfortably cater for over 100 guests, has retained much of its Gothic charm, whilst ensuring the needs of the twenty first century are more than adequately met.